The Convolution of Pip and Twig opens Friday Sept 1 at Live Arts! Opening night is quickly approaching, and Pip and Twig and our crew of collaborators and technicians are busy getting the final details in order for the big night. 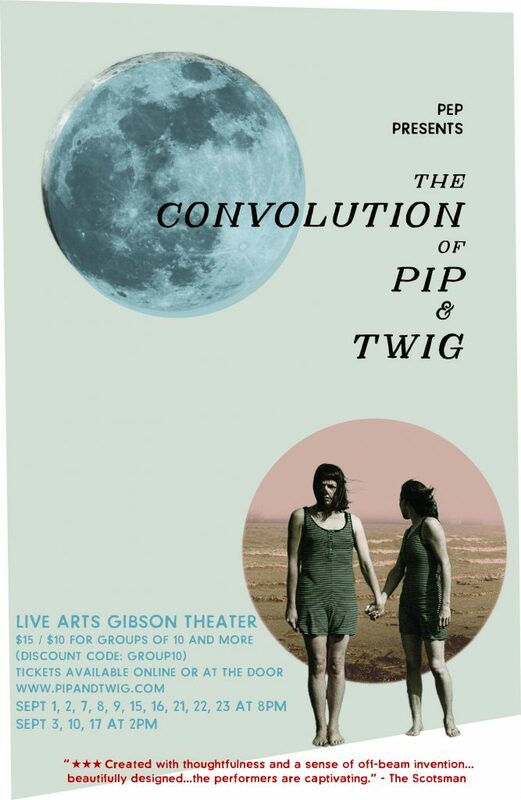 We hope you will come out to see The Convolution of Pip and Twig in our upcoming run at Live Arts’ Gibson Theater Sept 1-23. Since our run at The Edinburgh Festival Fringe, we’ve gone back to the design drawing board and to the rehearsal room. Even if you have seen the show before there will be plenty of new things to see! Our dear friend JP Scheidler, with the help of master carpenter Paul Borzelleca, has brought our re-design hopes to life in a beautiful way. Two wonderful artists, John Owen and Zap McConnell, have been working their painterly magic, and all of this is lit by the talented Heather Hutton. And as always, Martha Mendenhall’s direction, Jim Waive’s music, Jennifer Hoyt Tidwell’s texts, and Opal Lechmanski’s soundscape are still an integral part of Pip and Twig’s world. We have a group discount of $5 off per ticket for groups of 10 or more (discount code GROUP10) and we would love it if you would consider cajoling some friends and loved ones to join you at our show. If you decide to come opening night, Friday Sept 1, please join us for a glass of bubbly on the 3rd floor after the show.